Circles.Life has responded to the recent negative feedback it has gotten over its latest ad campaign. The telco was criticised by several netizens for the visual style and language it took for the campaign, which resembles advertisements which push social causes. One netizen, Hazirah Mohamad, shared online, her exchange with the company following a complaint she had launched over the ad, calling it “insensitive and dismissive of a real global problem”. However, other netizens defended the brand. Addressing other similar complaints on social media, Circles.Life thanked netizens for bringing its ad to attention, and said it would take note of its feedback, and “include it to the next round of process updates”. When asked about the backlash, a Circles.Life spokesperson shared that the company had no further comment on the matter. It confirmed that it worked with VML for the campaign, which ran on platforms such as OOH as well as Facebook. Another aspect of the campaign is also a survey the company did on data deprivation. As such, it pushed the telco’s 20 GB for SG$20 Data plus option, which targeted “data deprived Singaporeans” who may not realise they need more data. 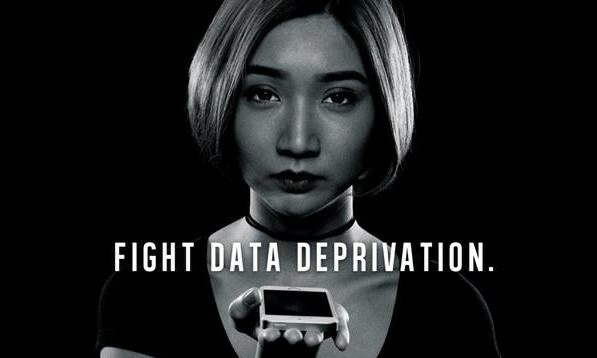 “Our data deprivation movement aims to bring awareness to the fact that Singapore has been deprived in mobile data offerings. Our users consume on average 8GB of data each month, twice the claimed national average,” the spokesperson said. This is not the first time the company has engaged in bold marketing campaigns. In March this year, the online telco pulled a marketing stunt which saw the vandalising of “competitor” out of home assets. The “competitor” in question was SGMobile, a fake company it created claiming to be Singapore’s “fourth telco”. This was to poke fun of the existing data packages using SGMobile, and build up to the Circles.Life campaign. The company also engaged influencers Youtiao666 to be the “vandals” involved in the campaign. What do creatives in the industry think of the ad? In a conversation with Marketing, renowned creative director Farrokh Madon, who has worked with the likes of McCann Erickson, BBDO, M&C Saatchi, JWT, Y&R and several other creative firms, said the ad was distasteful in how it equated data deprivation with starvation. “One isn’t necessary to live, the other is. It really trivialises a serious issue – Hunger – and shows insensitivity towards unfortunate hungry people,” Madon said. When it comes to utilising real issues in advertising, Madon added that it wasn’t about whether a brand should take issues, instead, it’s about what the brand does with it as it what shows the brand’s character. A brand is like a person. When you show insensitivity, you depict your brand as one with bad taste. And that can never be desirable. Meanwhile, Patrick Low, founder and creative partner at Goodfellas Consultancy is of the view that the campaign touches on a relevant issue encountered by mobile users. He added that it is based on the insight that mobile users are constantly needing more data. In addition, the choice of the word “Hunger” is deliberate to provoke thought and action. We need to lighten up as a nation or risk becoming third world in our thinking. Casey Loh, creative chief of The Clan (formerly known as GOVT KL), added, however felt that the ad was not one which was that offensive. “I don’t think it is such a big deal because they used images of sad-looking Singaporeans, and not actual poverty-stricken children or old folks,” Loh explained. How can brands strike the balance? While every ad aims to be memorable, Madon explained that brands need to be memorable for the right reasons. “For example, plastering a big four-letter word across your ad would get you attention, but whether not it is the right attention begs the question. Are you going to achieve this positive memorability by sounding insensitive? That’s a good filter to look through before you communicate,” Madon said. He added that comedians could be a good guide as to look at when banking on sensitive topics as they are able to touch on serious subjects but make light of it in a humorous fashion. As a brand if you don’t come across as compassionate and caring, at least be genuinely funny and entertaining. But please don’t leave a bad taste in the mouth. Meanwhile, Loh added that brands often face challenges to adopt world issues for commercial purposes, Loh said. As such, sometimes, it might just be wiser to stay away from sensitive issues such as this in marketing, if your audiences are not able to handle it. "Today's marketing world might as well be Westeros"
The sports brand leaps on the sprouting VoIP mobile app to call on fans to get out in the dark. ..
All about Instagram's massive monetisation move below. ..
"The longer Boeing stays nonchalant on any potential safety issues, the quicker trust and credibility will be eroded.".. Oath Summit 2018 was held on 6 November with keynote speakers giving inspiring speeches at the conference and predicting a number ..